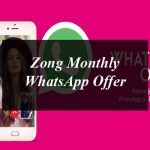 Zong, one of the leading cellular operators in Pakistan, has introduced an exclusive Ramzan Daytime offer for its customers. The Ramzan Daytime Offer by Zong is an amazing offer that lets you enjoy 1GB of internet data from Sehar to Iftar in just Rs.12 +tax. Zong Ramzan Daytime Offer is limited time and will end after Ramzan. Its auto renewal offer on daily basis.